Toronto’s Royal Ontario Museum has unveiled a brand new app called ScopifyROM, in an effort to allow visitors to get a more interactive look at some exhibits, including X-ray views of mummies and a close glimpse into a dinosaur’s mouth. Developed in partnership with Kensington Communications, ScopifyROM is a first of its kind interactive app for smartphones, which is now available as a free download in the App Store. 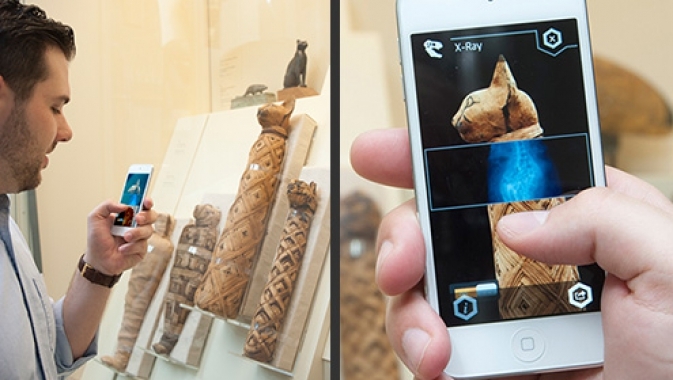 Using the ScopifyROM app, visitors can interact with selected museum objects in ways never before possible. Users can make discoveries and reveal the larger story behind each object, such as a story about life, history, or the planet. The app is suitable for both adults and families, and offers over a dozen objects to investigate. Scopifying the museum also lets visitors unlock five games, that include Footprints, Bat Hunt, Coin Conundrum, Crossbow Defender, and Dino Dig. ScopifyROM is the world’s first ScopifyTM smartphone app. It puts digital tools similar to those used by curators and scientists into your hands. Interact with selected museum objects in ways never before possible as you investigate, make discoveries and reveal the larger story each object represents: a story about life, history, or the planet. See an object where it was discovered. Scopifying the ROM lets you unlock five games.